International parity conditions: interest rate parity, relative purchasing power parity, Domestic Fisher effect or the International Fisher effect. There is a logical explanation for exchange rates fluctuations according to these theories, but only up to a point. These theories’ weakness is the assumptions which are subject to many challenges when it comes to real world applications and on which they are based. Balance of payments model: The focus of this model is on trading services and goods, but it doesn’t take into consideration the global capital flows which are increasingly growing as importance. This model couldn’t offer a good explanation for the dollar’s continuous appreciation in the 1980s and the 1990s opposite to the present US deficit of current account. Asset market model: this model emphasis currencies in constructing investment portfolios, as they represent a very important asset class. Depending on how much people are willing to hold the assets quantities at a point, so fluctuate the assets prices. People’s behavior towards assets, on the other hand, is very much due to what they believe those assets worth in the future. In long time frames, no model developed up to now managed to explain the volatility of exchange rates. For time frames of just a few days or less, prices can be predicted by using algorithms. The models presented above underline the influence of macroeconomic factors over exchange rates. 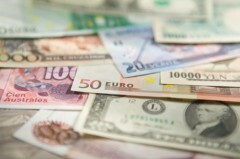 The prices of currencies result from the interaction between supply and demand. Markets around the world which trade currencies are somehow like an enormous melting pot: current events are mixed and always changing, so factors influencing the supply and demand are shifting constantly, so does the prices of currencies in relation to other currencies. Foreign exchange market is the market which best encompasses the world’s events at a given time, no matter when. There isn’t a single element that influences the supply and demand of currencies, its value respectively, but several. There are three categories in which these elements can be divided: market psychology, economic factors and political conditions. (b) economic conditions – found in economic reports or other economic indicators. The economic policy includes a country’s monetary policy and the government fiscal policy. Deficits or surpluses in the government budget: the widening of government budget deficits usually produces negative reactions in the market. At the opposite end, positive reactions are the result of narrowing budget deficits. These reactions are also reflected in the currency’s value. Trade trends and levels balance: The goods and services demand is reflected by the international trade flow. This is further reflected in the currency demand in conducting trades. Political events and conditions taking place internally, regionally or internationally have a great influence on the currency markets. Ruling party anticipations and political instability influence all exchange rates. A nation’s economy can be seriously affected in a negative way by the political instability and upheaval. On the other hand, if a country is facing financial difficulties, the rising of a political faction which is perceived nationally and internationally as fiscally responsible can influence the country’s currency in a positive manner. In the same way, one country’s or even region’s local events may influence the interest of the neighboring country, which, ultimately, can lead to the fluctuation of that country’s currency. There are various ways in which the trader perceptions and market psychology can influence the market of foreign exchange. Flights to quality: this flight to quality may be the cause of unsettling international events. Investors may be tempted to move the assets they own to a place they perceive as safe, so the capital also flies to that direction. Demand rises, thus the prices rises in the case of currencies which are perceived as stronger in relation to other counterparts which, consequently, become weaker. When the economic and political landscape seemed uncertain, the “safe havens” of foreign exchange has always been considered the Swiss franc, gold and the U.S. Dollar.